Red Flannel Ghost in Cedar Springs? The cable channel “SyFy” that hosts the show “Ghost Hunters” is looking at the site of The Cedar Springs Post Newspaper for a possible episode to be broadcasted here in Cedar Springs. They will be looking for evidence of apparitions or ghostly encounters that have been regularly occurring at the building since as far back as 1988. History shows that the building was once the actual Red Flannel Factory where Mae Oppenneer and her ladies sat at their sewing machines on the upper floor, stitching together the infamous red flannel undergarments that were displayed and sold on the main floor at 36 E. Maple St. Originally, the “factory” now turned newspaper, was a barn for the home on the corner of Maple and First streets which burned to the ground only a year or two ago. Recent renovations to the building have uncovered documents in a crawl space located in the basement that give rise to the theory that the making of the red flannels was actually an “undercover” operation for part of the original underground railroad. Is it possible that the factory was also a safe haven for slaves on their way to Canada? It appears that after a short layover in Cedar Springs, they were transported by the railroad that passed through town, the old G. & I. Dressing like lumberjacks, using the red flannels as part of their disguise, slaves would board the train at night for safe passage north. The fact that the red flannels suddenly became the focus of our young nation during a frigid and unforgiving winter, bringing red flannel warmth and spirit to men, women and children across the country, was just another part of the red flannel heritage. 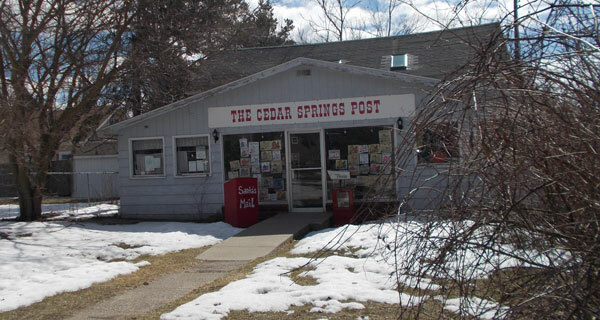 The building has since been sold several times and has been the site of more than one business including, Sipple’s TV repair, a consignment shop, and for the past 25 years, the home of The Cedar Springs Post. After writing a descriptive letter to the SyFy channel, Allen received a response from the producers of the show Ghost Hunters. They will first survey the building and check for unusual spikes in certain electrical fields. If indeed there is “something of interest,” discovered, the show will go on! Stay tuned to your idiot boxes. The first broadcasting will begin on April first.